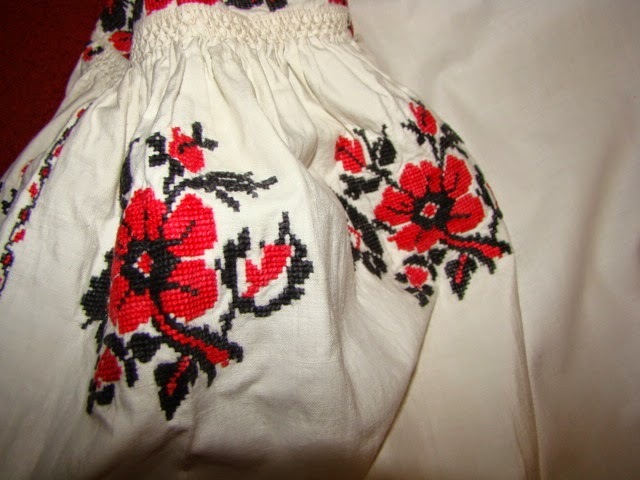 Today I will address a type of embroidery which excites strong feelings among Ukrainians. 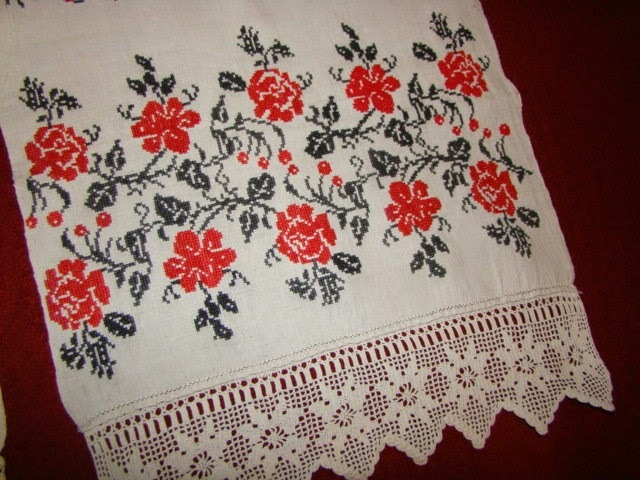 It is typified by the Rushnyk from the Borzniansk district of Chernyhiw oblast shown here, The emblematic 'Ukrainian Rose' in red and black cross stitch. 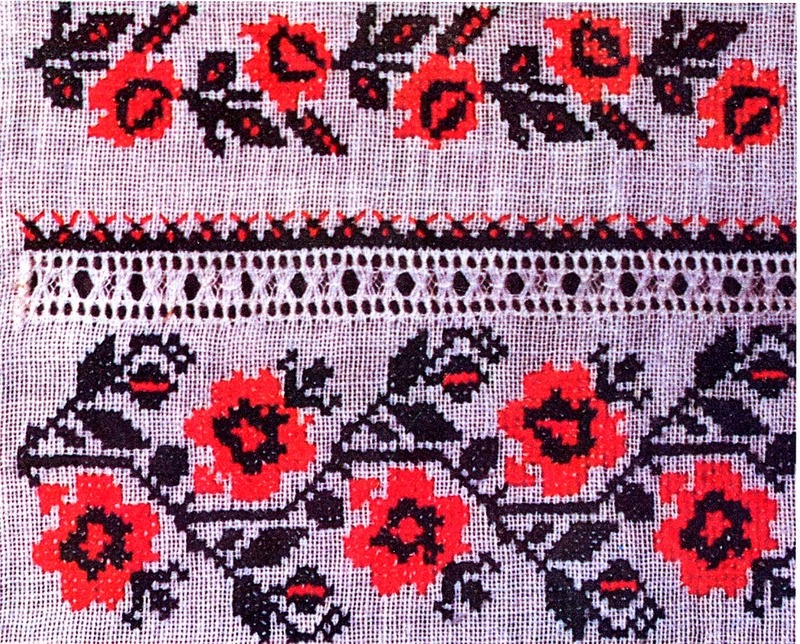 Many people, including many Ukrainians consider this to be the most typical and widespread type of embroidery in Central, Southern and Eastern Ukraine. You will find many popular publications which show graphs of such designs. 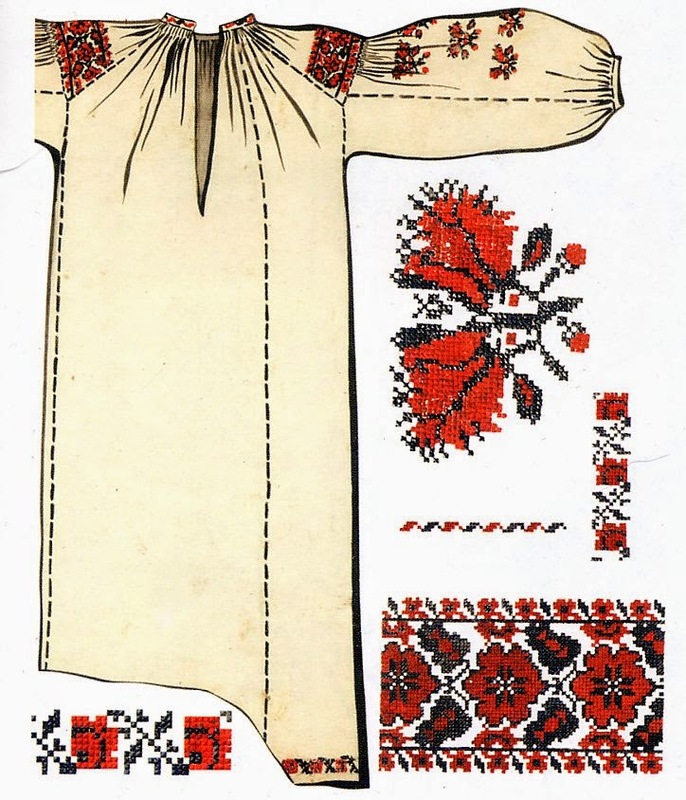 On the other hand you will find few such designs in books written by those who study the history of Ukrainian costume and embroidery seriously. 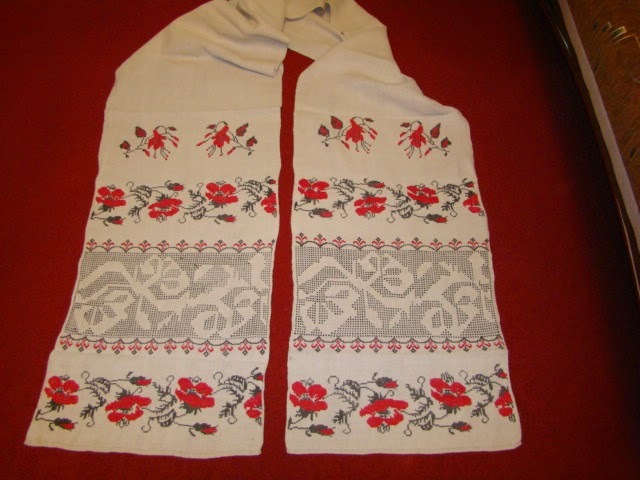 They state emphatically that this is NOT a traditional form of embroidery in Ukraine. Curiously, both of these statements are true. 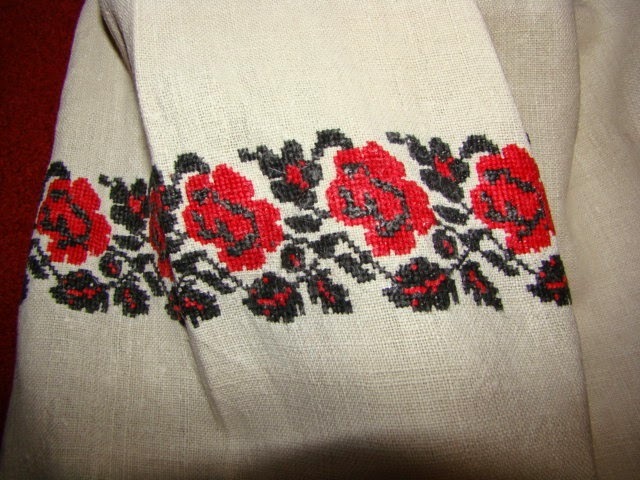 A casual survey of photographs will turn up many examples of this type of embroidery. 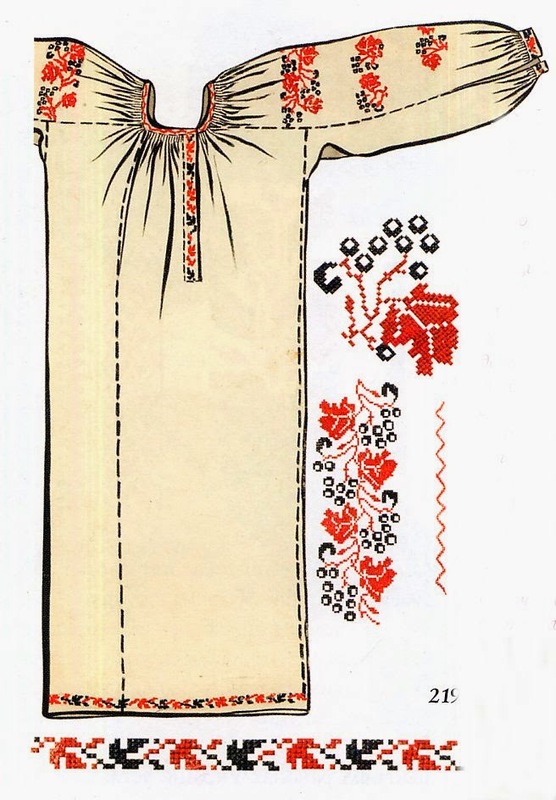 Here is a married woman's festive outfit from the beginning of the 20th cent now found in a Museum in Moscow. Here is a photograph of two women taken very early in the 20th cent. 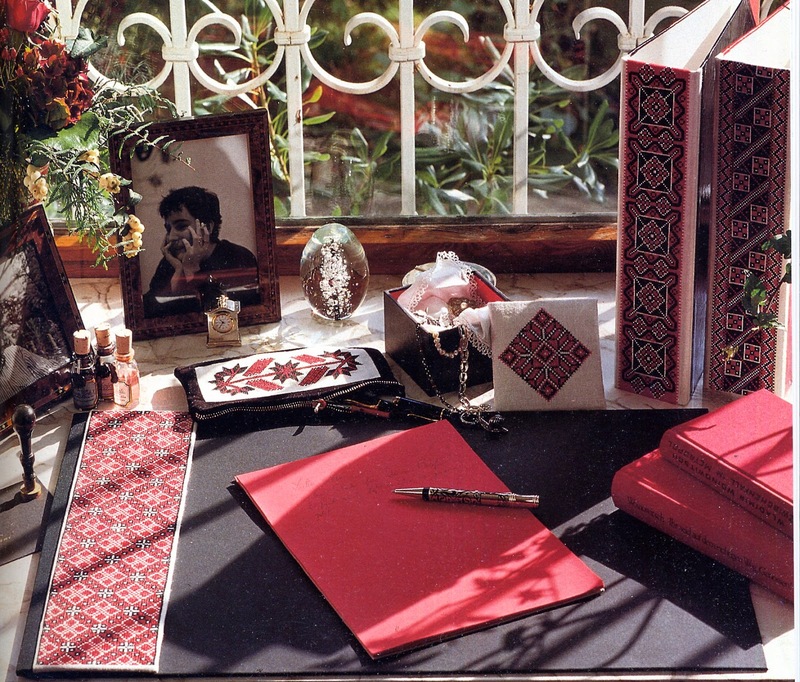 in Odessa. 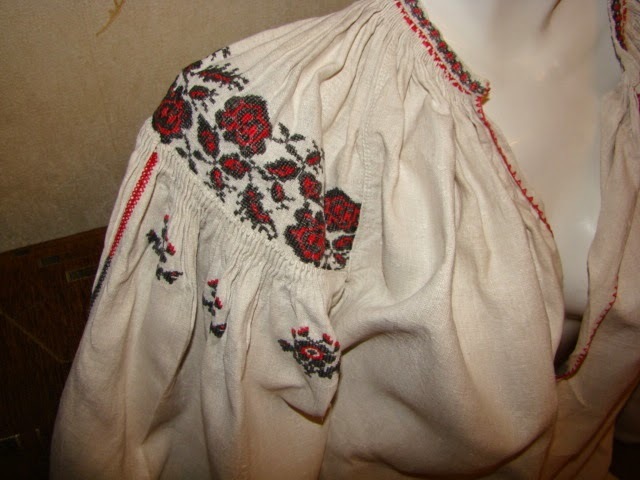 You can clearly see the cross stitched roses on the chemise of the one and the apron of the other. 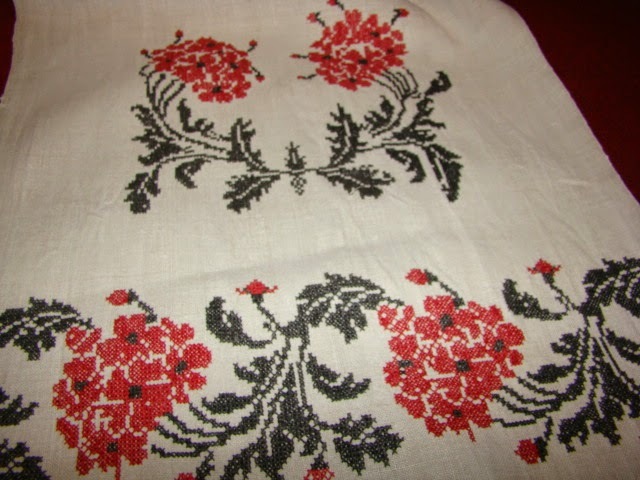 Here is a photograph of a pillow embroidered quite recently. 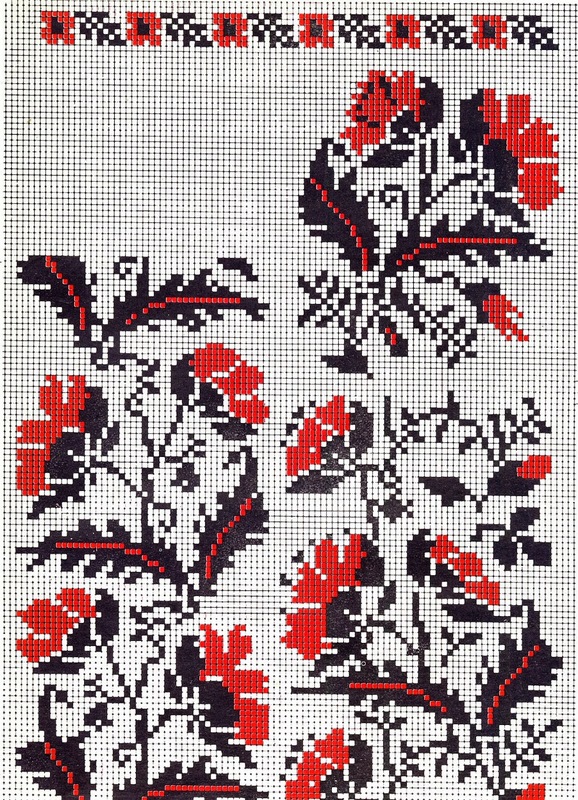 Cross stitch is a very ancient technique, Some of the most ancient peoples of Southeast Asia, the Hmong [Miao] and the Mien [Yao] have brought this type of embroidery to a high art. It is considered emblematic of the people of Syria and Palestine. 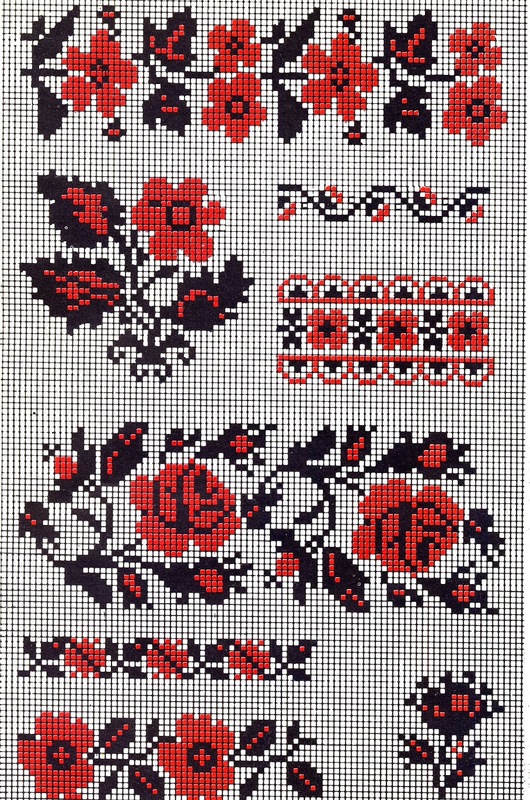 There have been cross stich pattern books printed in Germany as far back as the 1500's. On the other hand, it is a newcomer to the Steppes of Ukraine. 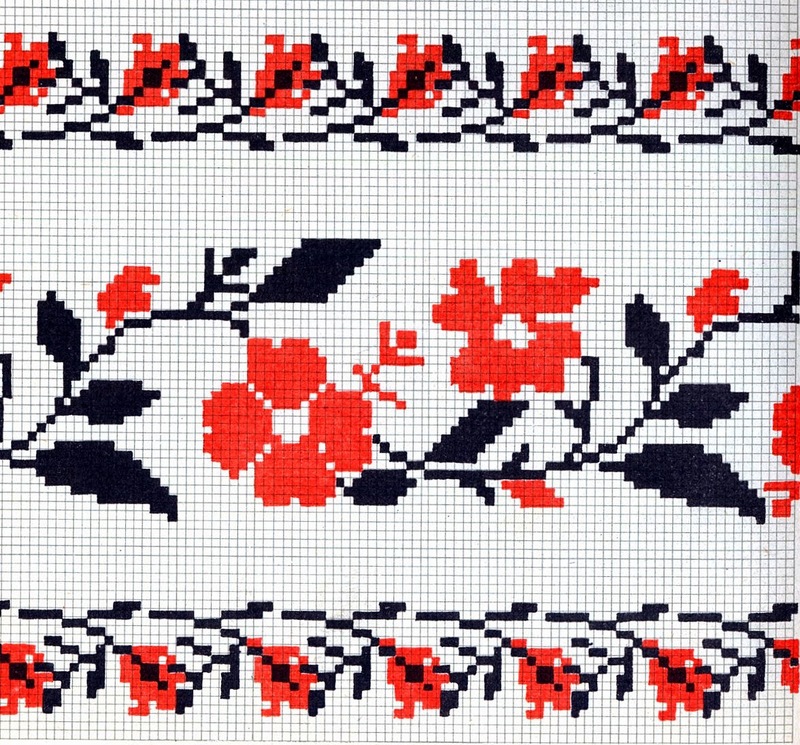 In the 1800's across Europe there started a habit of publishing designs for women to help teach handicraft. 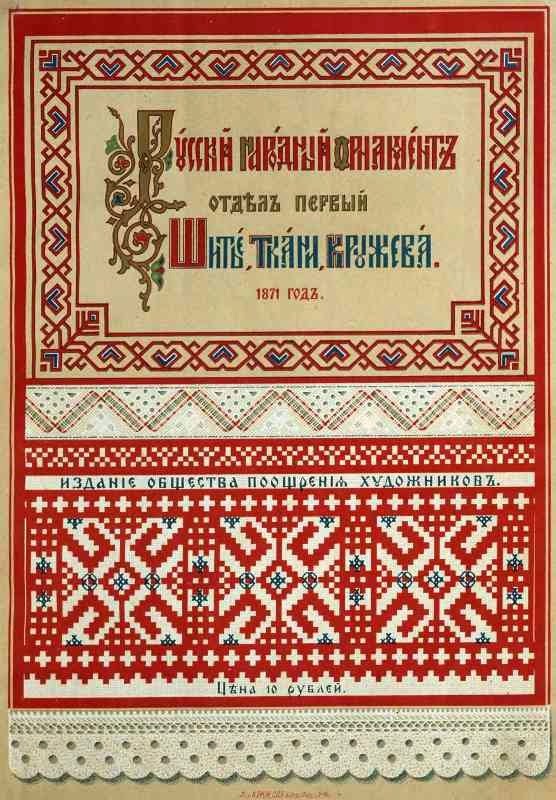 From about 1850, publications such as 'Niva' and 'Rodina' began to spread such graphed designs in Moscow's Empire, which at the time included the central and eastern parts of Ukraine. A bit later, in the 1864, a man by the name of Henrich Brokar who was part French and part Russian started a perfume and soap factory in Muscovy. 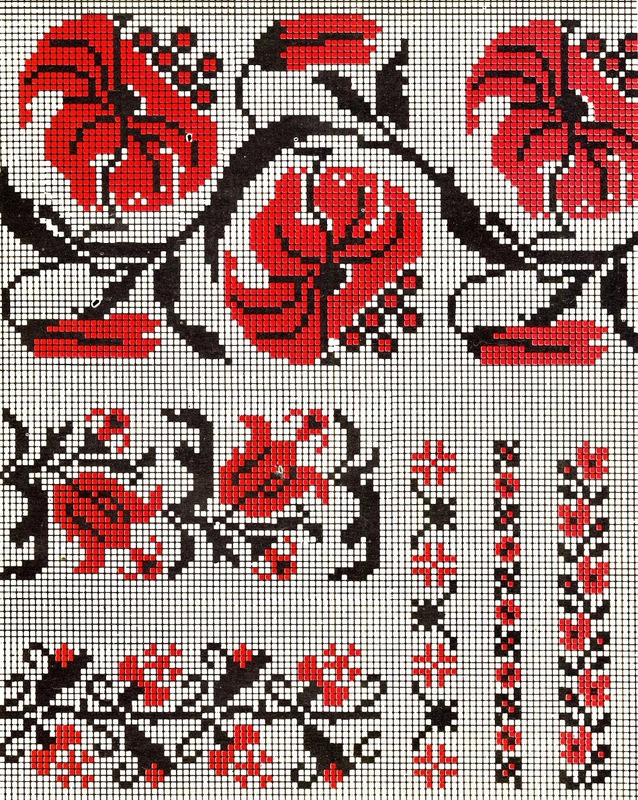 In the wrappings of each article, in particular the soap, he included a cross stitch design of 'peasant embroidery', which his artists had drawn. This had the effect of getting town and city people in Russia, Bielorus and Ukraine to start embroidering. The concurrent Romantic movement made these people start to value the peasant art of their nations, which they had heretofore looked down on. 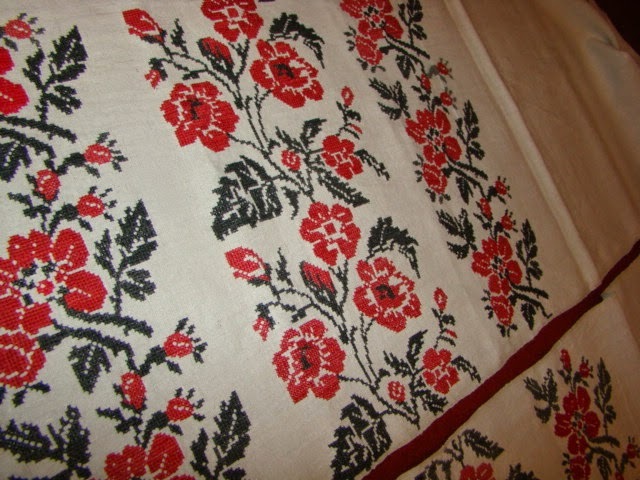 In a desire to get in touch with their roots they turned to these graphs which were portrayed as traditional embroidery. Here is the cover of on such publication. 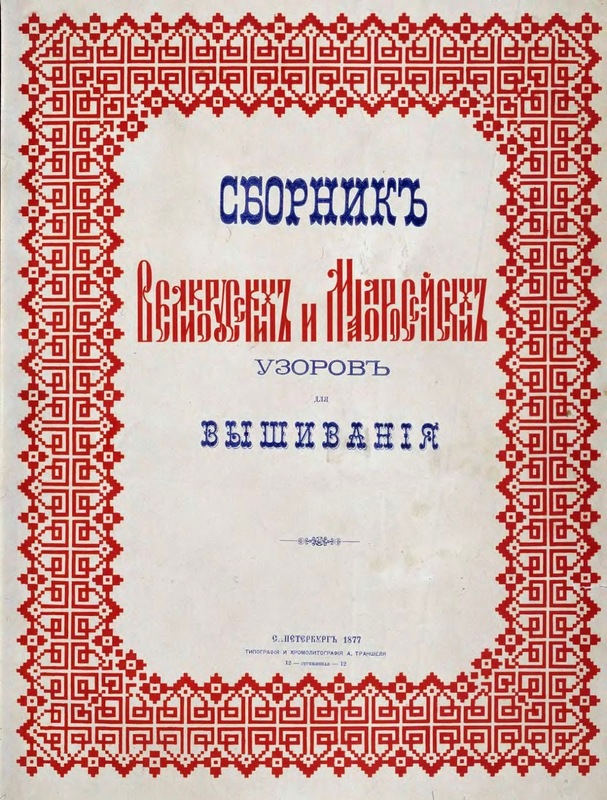 The title translates as 'A collection of Great Russian and Little Russian [sic] patterns for embroidery' published in St Petersburg in 1877. You may view the rest of this publication and others here. 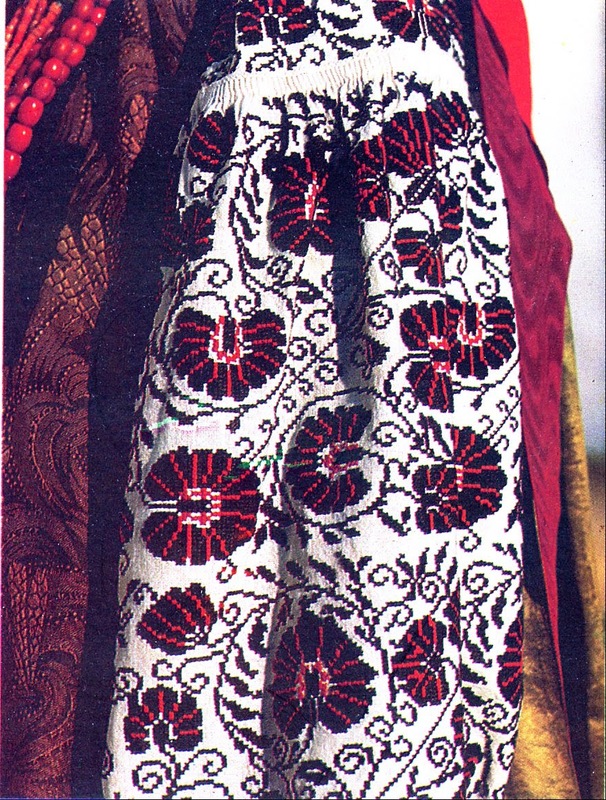 It is unclear where these designs came from originally, but they appear to have been drawn from various sources. Many of the designs in this particular publication look like they were inspired by those of western Europe, especially the ones which feature people and animals drawn naturalistically. 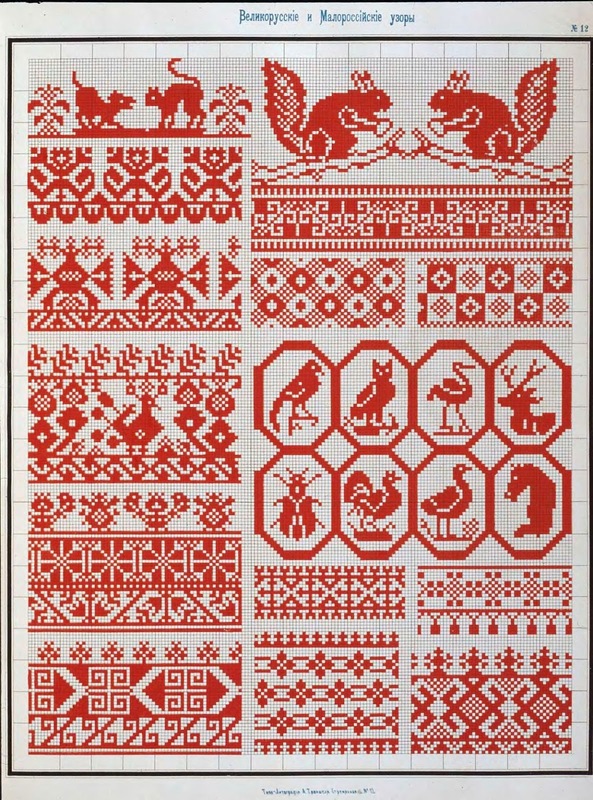 You will recognize some of these designs on the Russian Town Costumes. 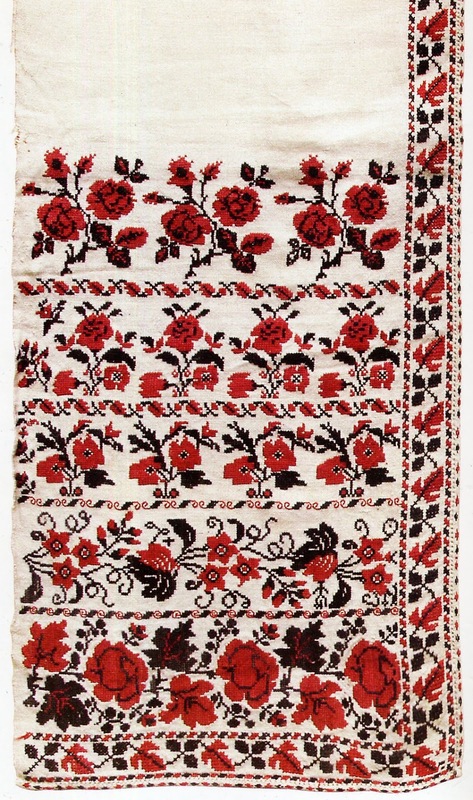 On the other hand, some of the geometric designs would look very familiar to Ukrainian embroiderers or weavers. 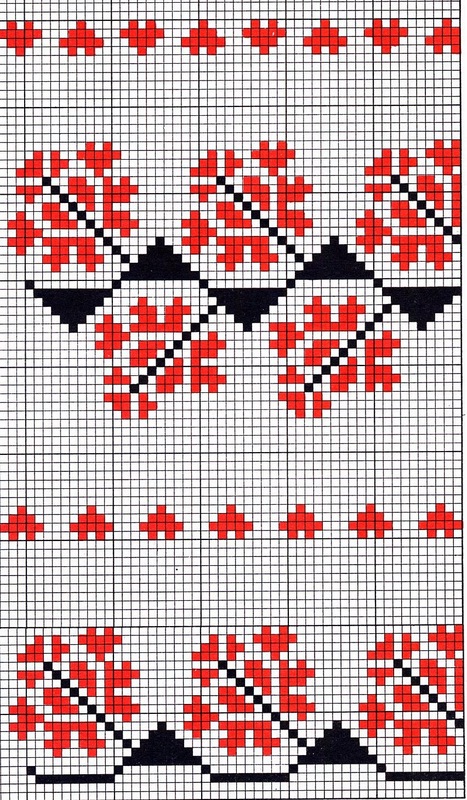 Many of these designs are popular in contemporary Ukrainian embroidery, as opposed to the regional styles. 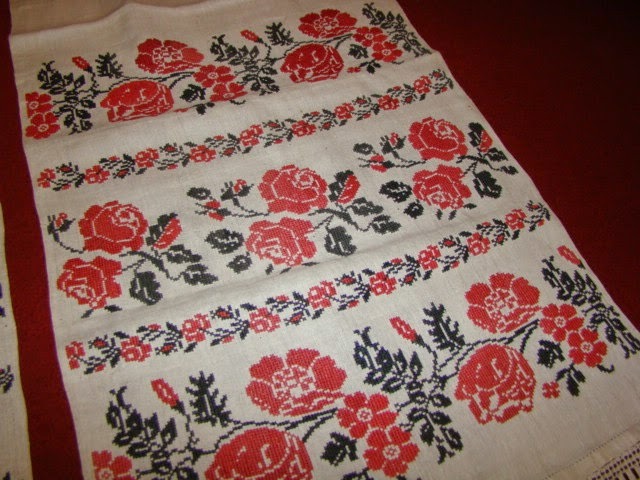 I am of two minds about these designs, some, like this rushnyk have nothing about them which is typically Ukrainian. This could just as easily have been stitched in Switzerland. 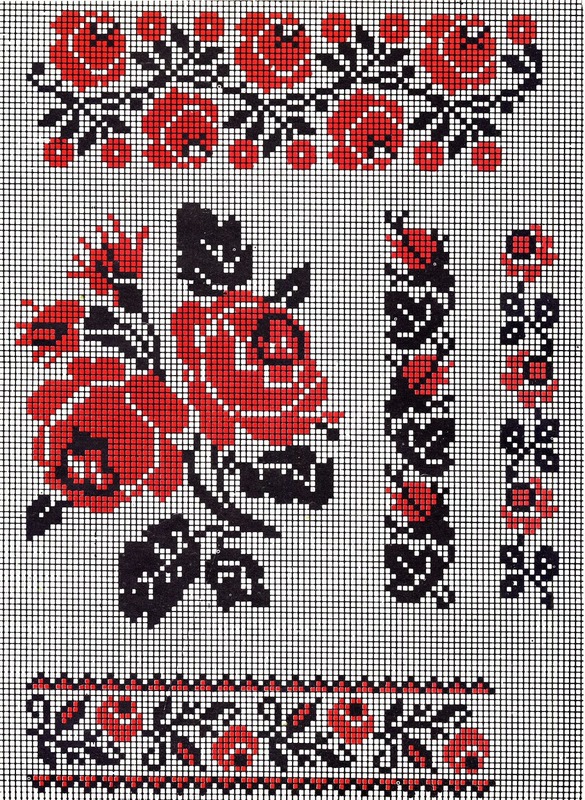 On the other hand, there is a body of designs which have become recognizable as Ukrainian, witness this illustration from a book printed in Germany entitled 'Cross stitch patterns from old Russia' [sic]. 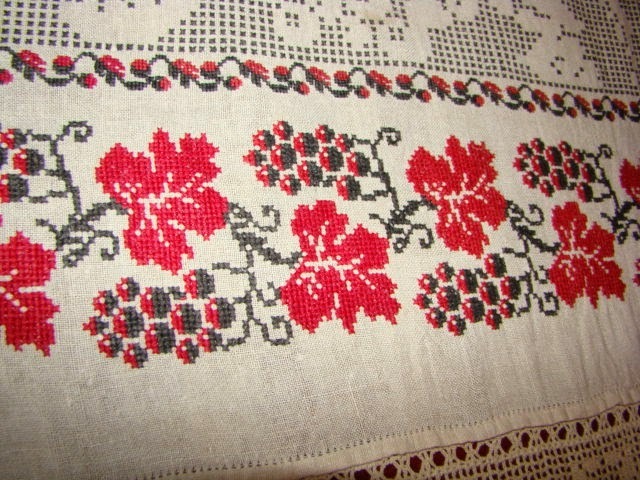 Any Ukrainian would recognize this type of design. 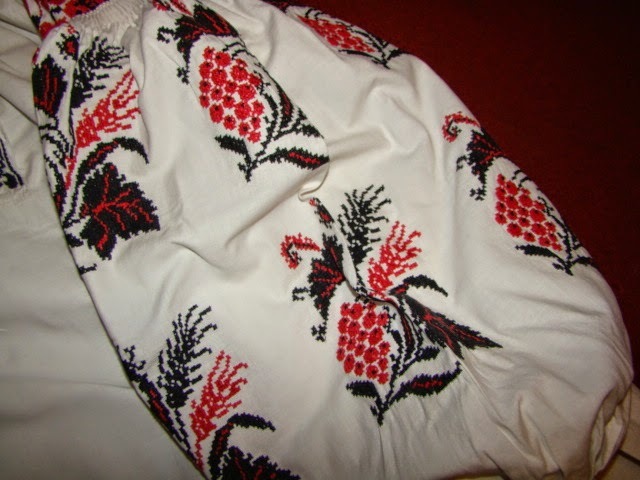 For their part, Russians who study their own embroidery tradition seriously do not claim these designs. 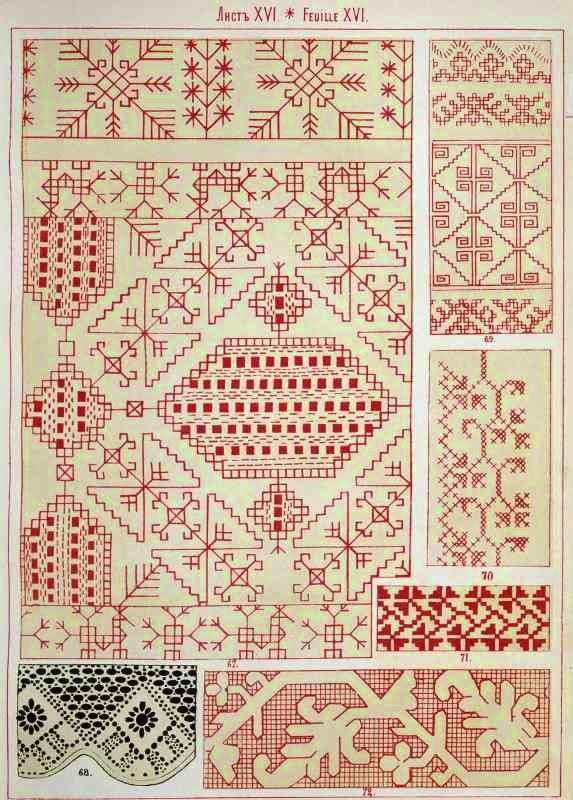 Here is an old book of embroidery designs from Russia with a representative page [although I recognize some Khanty and Chuvash designs among them]. 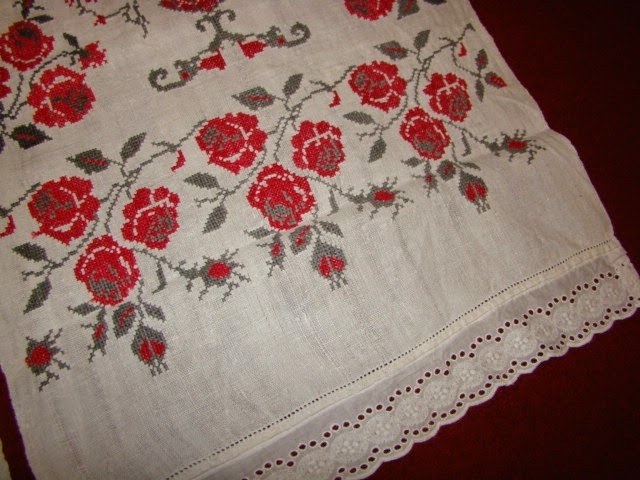 Curiously, I have not found any examples of the rose embroidery in the limited few such books which I have looked at. But there must have been some, as one can find widespread hints. 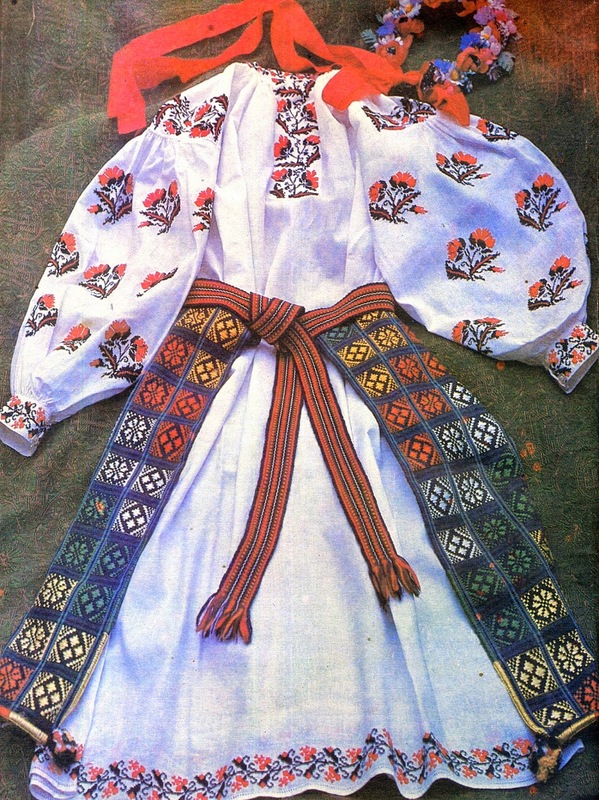 Estonian Folk costume from Torma in South Estonia. 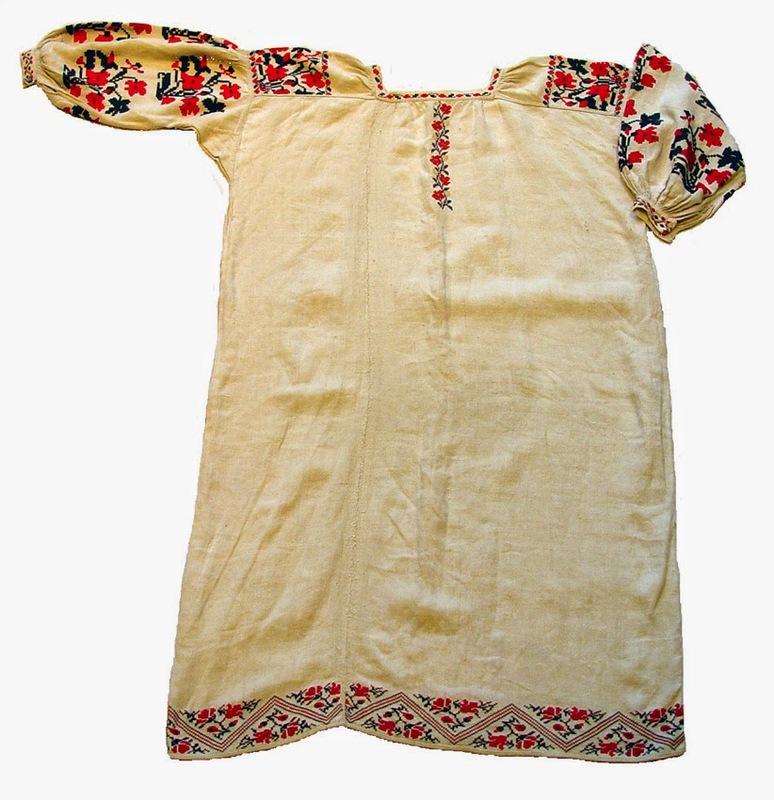 Chemise of unknown nationality from the village of Enotaevsk, Astrakhan region. 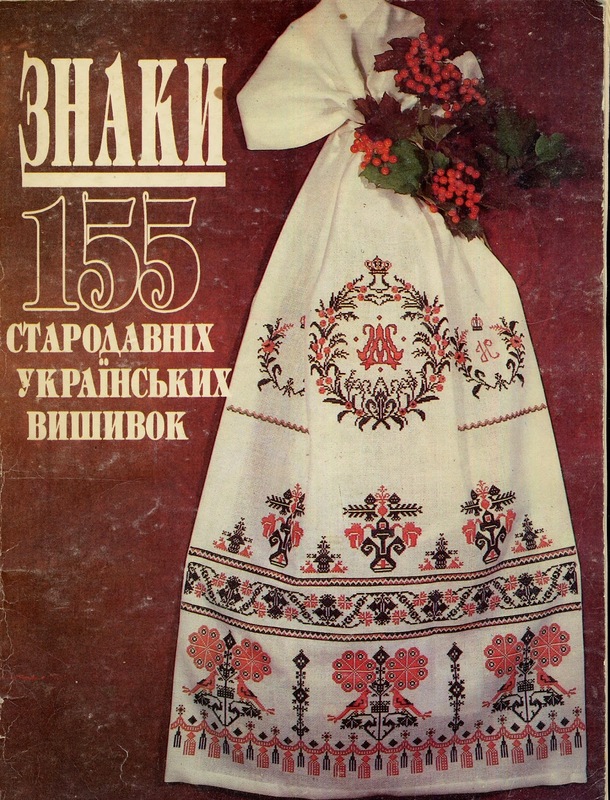 This piece may well be Ukrainian. 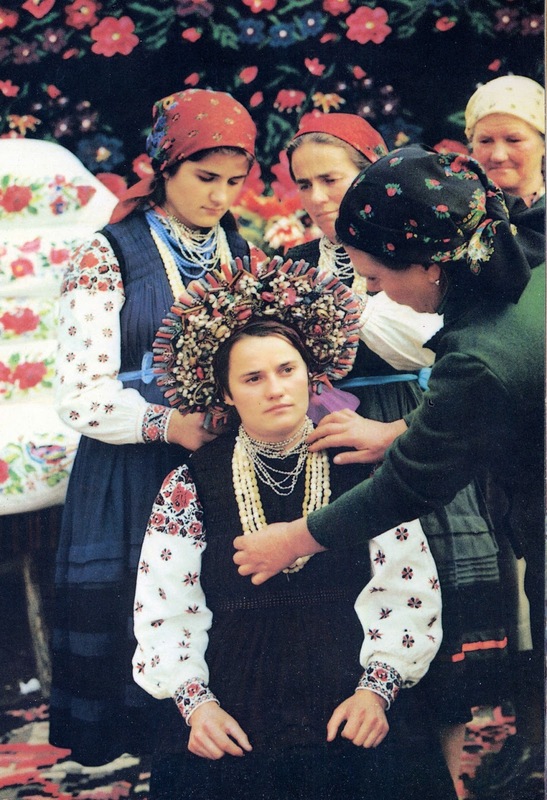 Former Soviet Moldova, a bride from Kamenka district being prepared for her wedding. Belarus, the village of Berazniaki in the Zhytkavichy region. 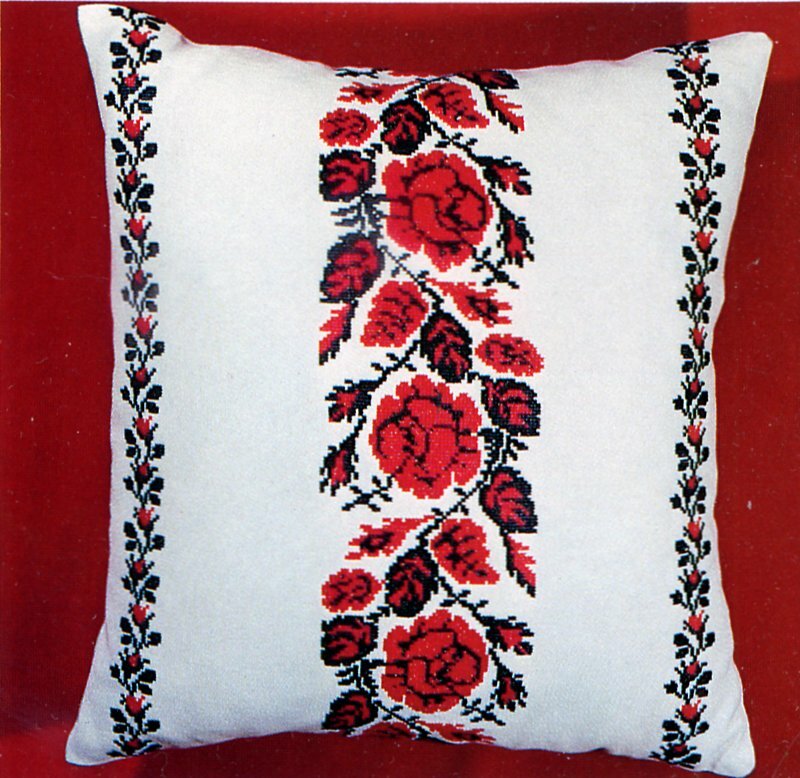 Clearly these designs were being promulgated widely within the western Russian Empire. 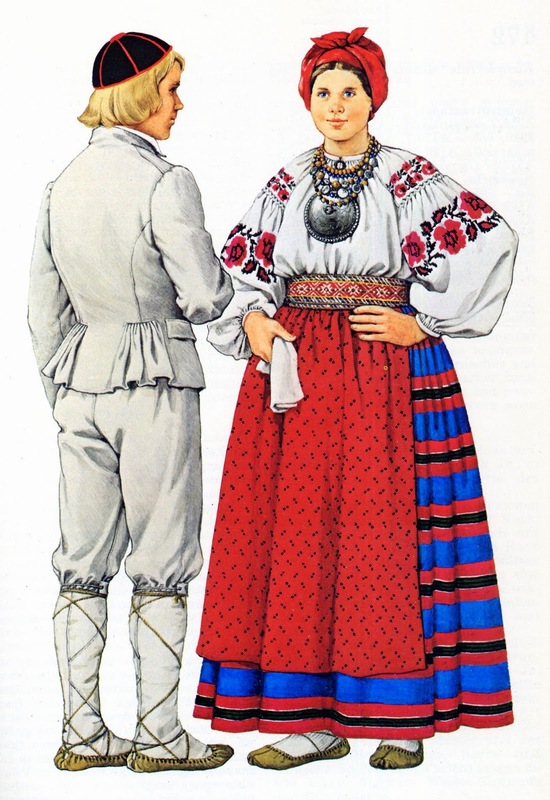 While these designs remain exceptions among the Estonians, Moldovans and Russians they have been embraced by the Ukrainian and Belorussian people. 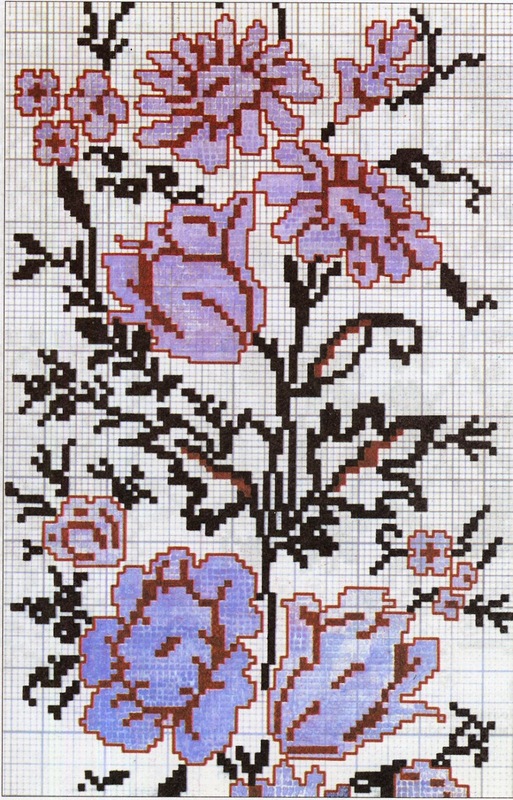 And they are not limited to roses; many of the designs feature other flowers, and once opened, the Pandora's box of creativity of the people resulted in many versions of this type of design. 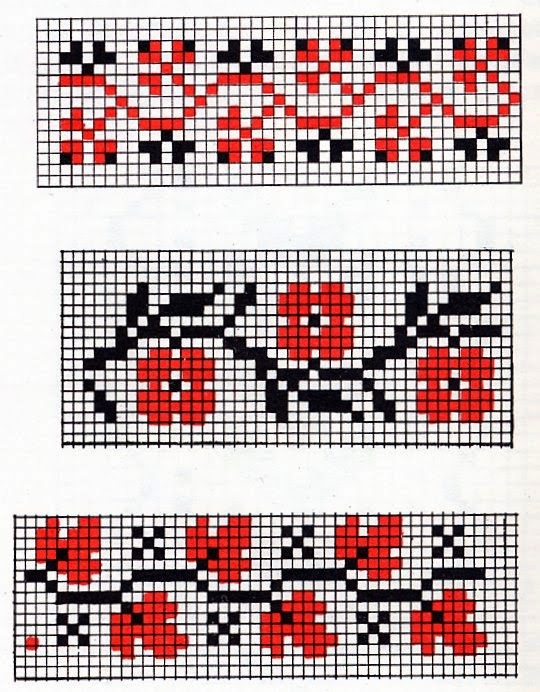 In the popular pattern books of Ukrainian embroidery, if not in the scholarly works, these designs abound. 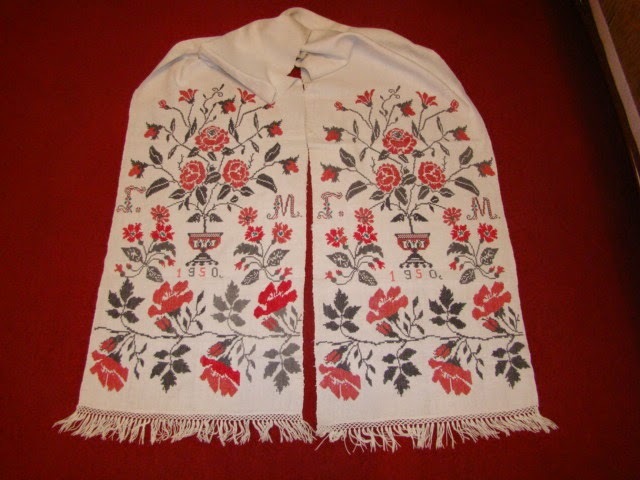 In a sort of role-reversal, some of these designs have been adapted for older embroidery techniques, such as Poltava merezhka. 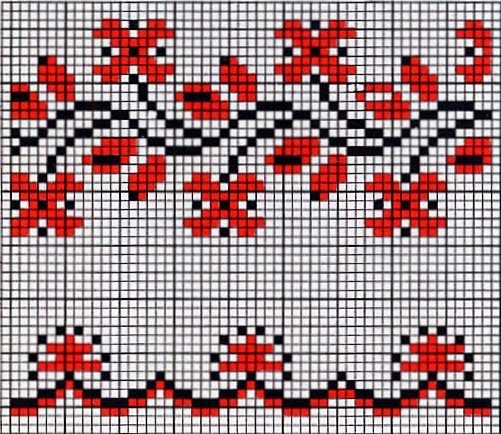 In conclusion, while we should remember that these designs are a recent addition to the canon of Ukrainian embroidery, and we should make every effort to keep and spread knowledge of the older techniques, I feel that we should recognize that these designs are here to stay, and enjoy their beauty as well. I will provide some more examples of these designs. 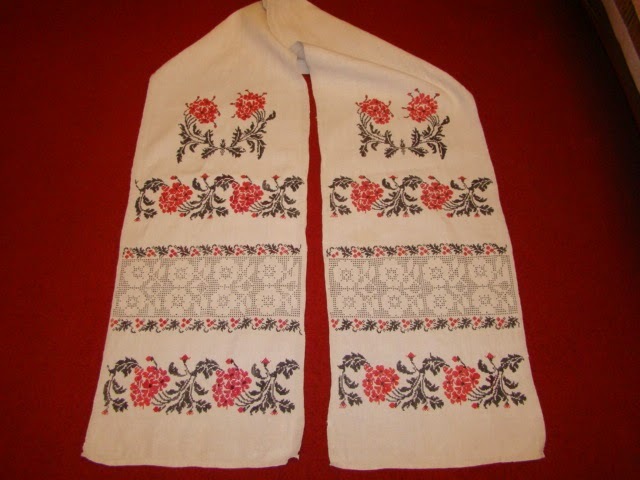 Here is one to be embroidered in white with a red outline from Sumy oblast. 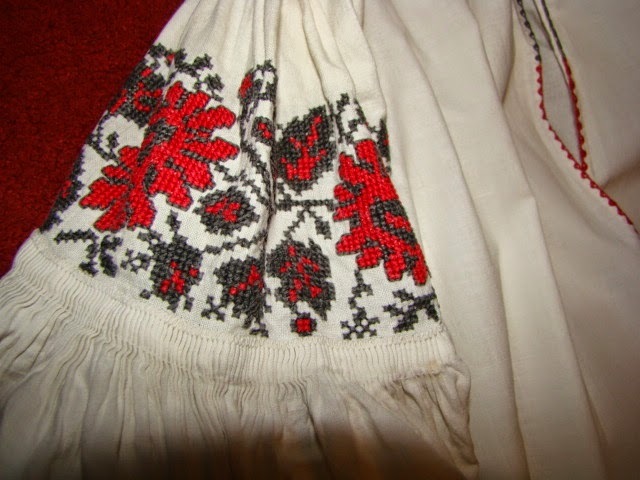 This chemise is from the Borodniansk region of Kyjiw oblast. 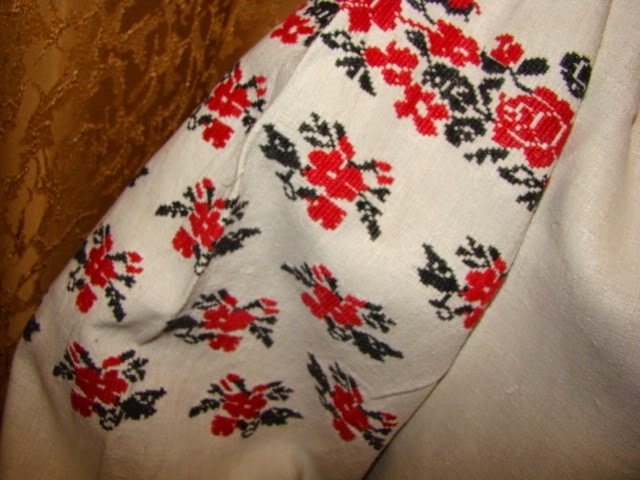 Man's shirt from Poltava region. 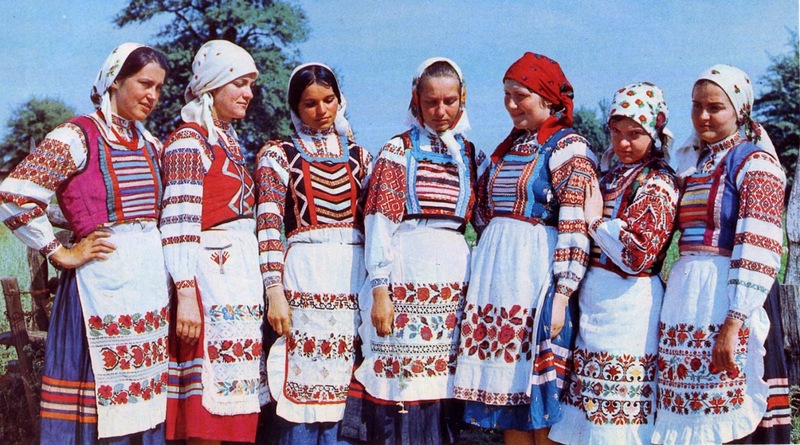 Woman's chemises from the Cherkasy region. 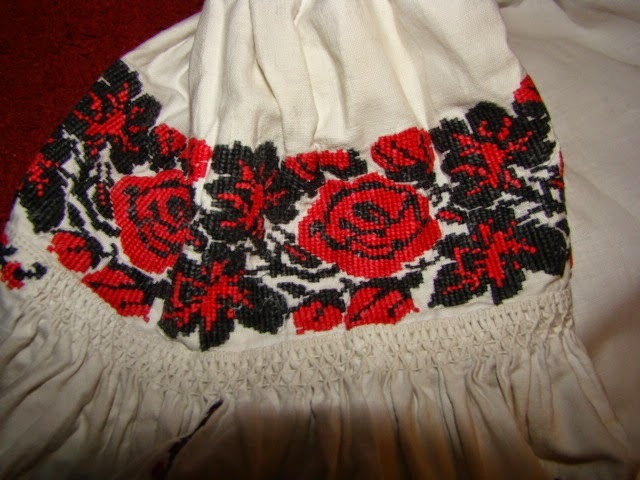 These examples above are from online, and may be obtained on ebay, along with mens shirts and womens chemises from other regions, rushnyks, etc. 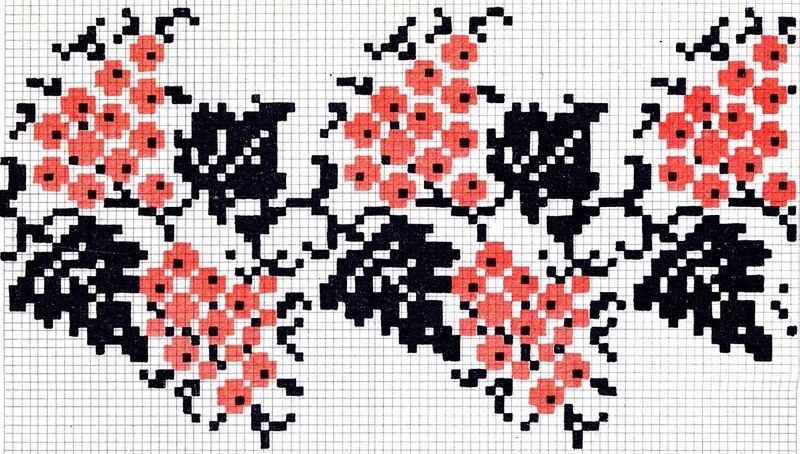 Poppy design from Kharkiw region. 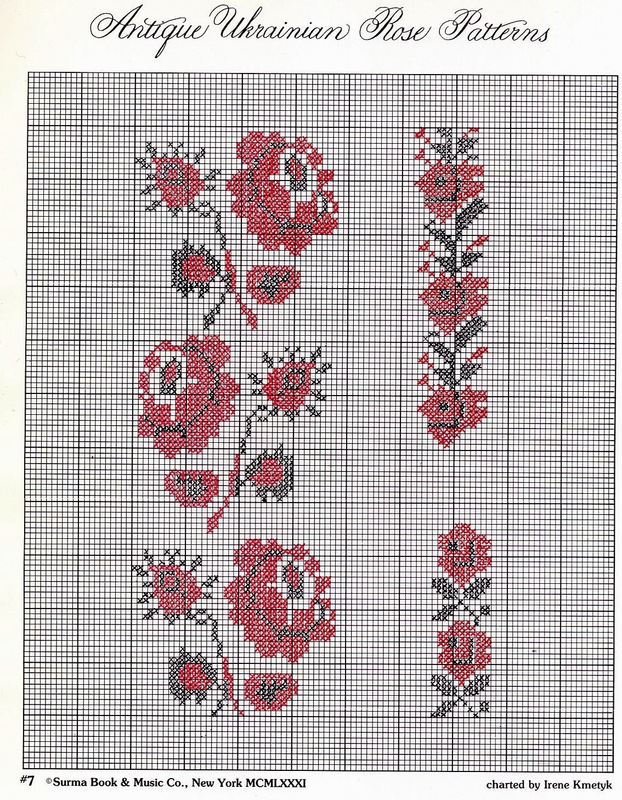 Some daintier, more comtemporary designs from Ivana Zel's'ka for girl's blouses. Rushnyks. These are also taken from ebay. See the link above. 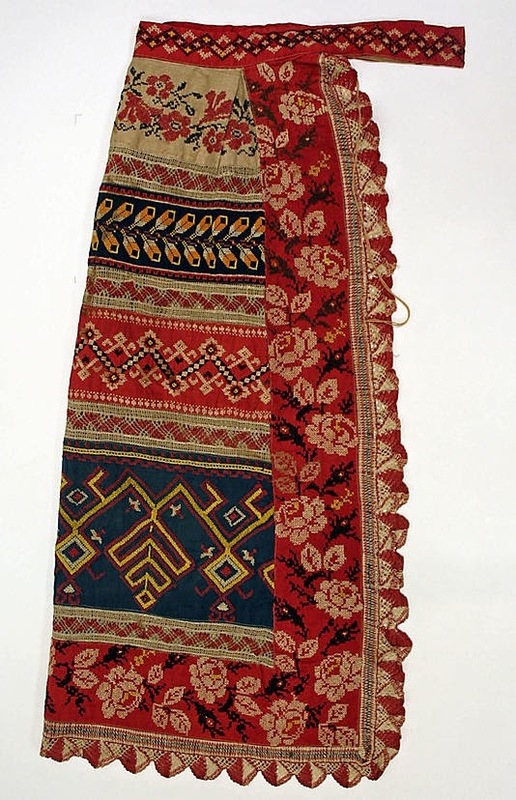 Man's costume from Sosnychka region, Chernyhiw oblast. 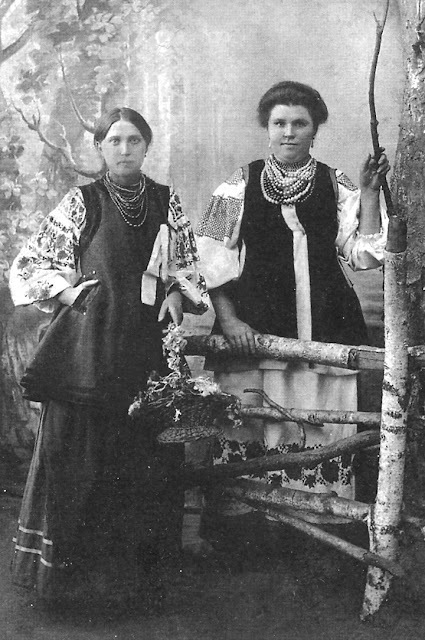 Two women's chemises from Perejaslaw-Khmel'nytsky region, Kyjiw oblast. 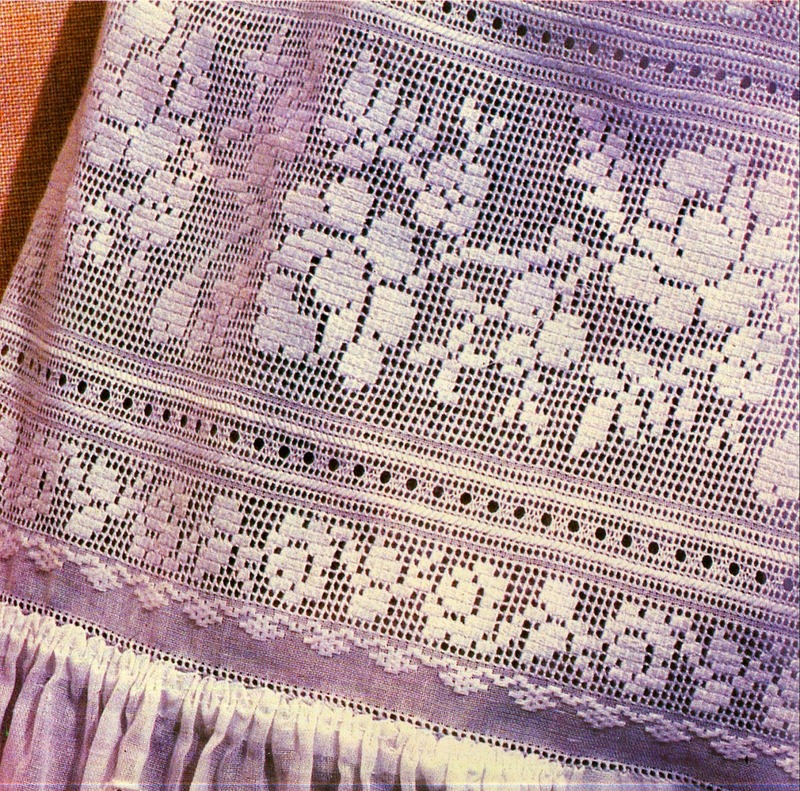 A girl's outfit minus the apron, with the embroidery graphed. 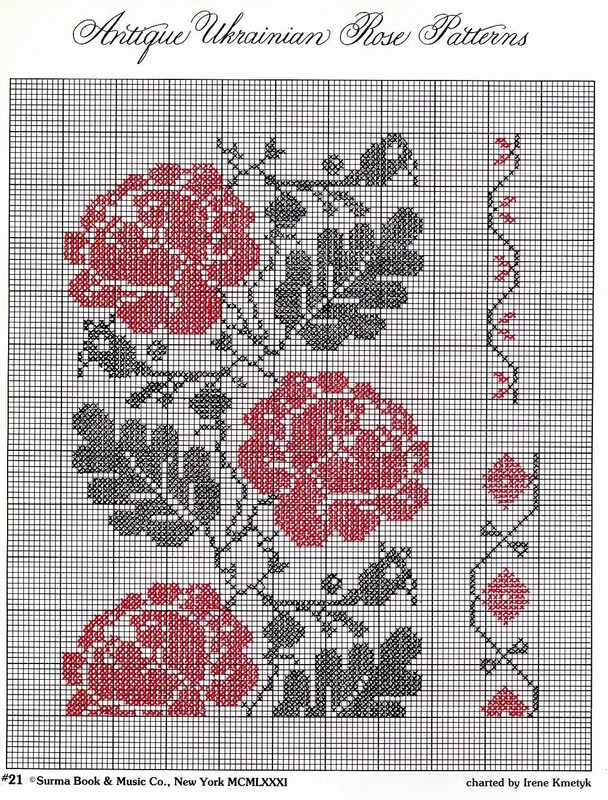 For those interested in embroidering these designs, the two reds most commonly used are DMC 666 [bright red] or DMC 321 [cherry red]. Thank you for reading, I hope that you have found this to be interesting and inspiring. Take some of these designs and use them. Thank you for such interesting article and illustrations! А cover of Antique Ukrainian Rose Patterns is much like those roses that were embroidered at Rivne Polissya region, both womens' and mens' shirts. As for colours - there are also DMC 817 and 498. Just a quick note to let you know how much I enjoy your blog, which I discovered quite recently through Pinterest. 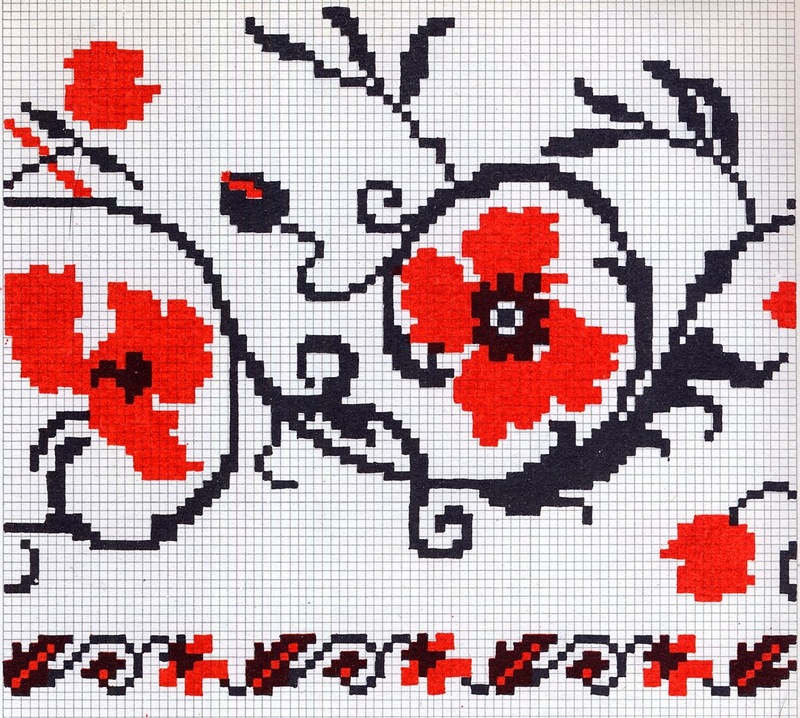 I have a board dedicated to Ukrainian embroidery, which is a longtime interest of mine. 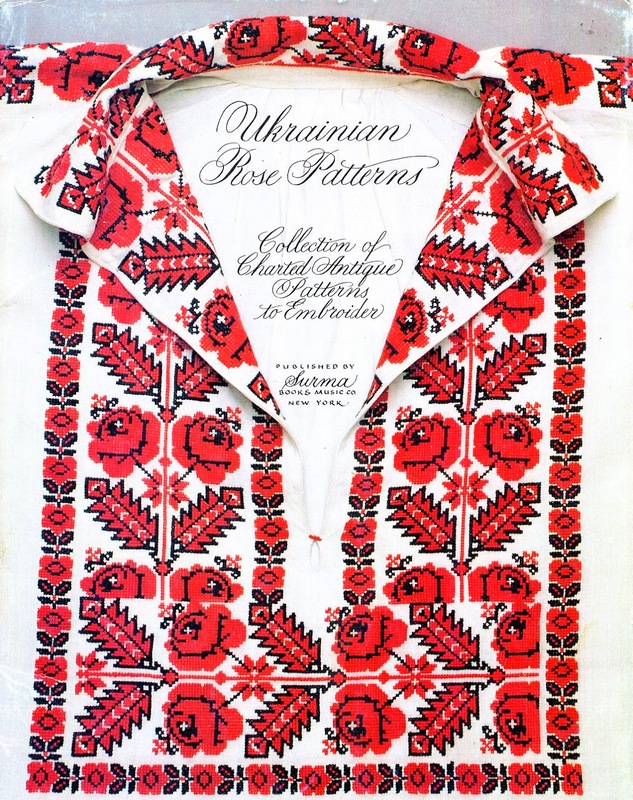 This is the second time I've read this post about origin of the Ukrainian rose patterns. I think it's fascinating, and kind of funny in a way. I mean...whoever would have guessed they originated as a freebie wrapped with bars of soap? as always, astounded and pleased by the posts you make, and by the sheer amount of content easily located in one place, and the ease at which I can find the information in one place (which I have read in bits and pieces scattered throughout other books). Thank you for this!